We present a review of transcatheter aortic valve implantation (TAVI) in the presence of a mechanical mitral valve. We conclude that in patients with a prior mechanical prosthesis, TAVI is feasible and can be carried out without complication. Based on proof of feasibility, evidence to date would suggest that patients with mechanical prostheses be actively considered for TAVI going forward. Transcatheter aortic valve implantation (TAVI) has become standard of care for patients with severe aortic stenosis at prohibitive operative risk for surgical aortic valve replacement (SAVR).1 The first randomised-controlled trial of TAVI stipulated the presence of a mitral valve prosthesis as an exclusion criterion for enrolment in the trial.2 The main reason was concern that dysfunction of the mitral valve prosthesis might arise during TAVI valve deployment.3 Further concerns were that the presence of a rigid mitral prosthesis would inhibit complete valve deployment or would result in the valve slipping; a ‘watermelon seed’ effect.4 Despite this, a number of authors have published successful cases of TAVI in the presence of mechanical valve prostheses. An online search of PubMed was performed on 30 August 2014. Search terms used included permutations of percutaneous, transcutaneous, transcatheter, transarterial, transfemoral, transapical, TAVI, transcatheter aortic valve replacement (TAVR), mechanical mitral prosthesis. Additional studies were identified using references cited within appropriate articles. Data were extracted by two independent authors (KOS, EH) and discrepancies were resolved by discussion. We identified 397 studies of which 16 were selected for full review. Of these, 11 were isolated case reports, and five were case series reporting two or more cases. A total of 35 cases were identified. Fifteen cases describe Medtronic CoreValve® implantation, 15 Edward Sapien®, three Sapien XT, one Medtronic Evolut™, and one JenaValve™ (figure 1. One case describes CoreValve® implantation with an interval subsequent implantation of an Edward Sapien®. Of these, eight authors report transfemoral cases (49%, n=17), outlined in table 1. 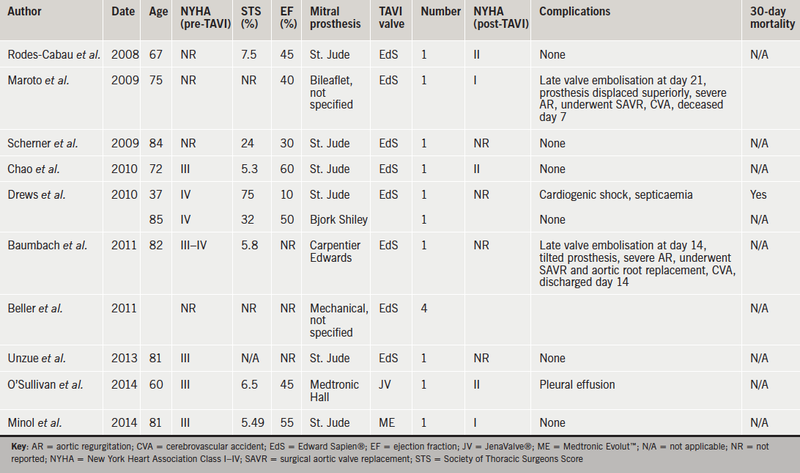 Ten authors describe a transapical approach (40%, n=14), outlined in table 2. One author outlines cases performed via a transaortic approach (11%, n=4). Despite initial concerns, feasibility of transapical, transaortic and transfemoral TAVI in the presence of a mechanical prosthesis has been demonstrated. Experience to date, however, is limited and this patient cohort represents a relatively small proportion of the overall group eligible for TAVI. Considering our systematic review predominantly identified case reports, it is difficult to draw any firm conclusions regarding complication rates and 30-day mortality compared with larger patient cohorts. Furthermore, there is a significant risk of publication bias with authors more likely to publish successful cases of implantation than incidences of failure. This creates a likelihood of underestimation of the potential dangers involved. Nonetheless, the complications reported in cases published are well accepted; pacemaker insertion, endocarditis and mild paravalvular leak.2 What makes this group unique is the propensity for mechanical valve dysfunction, either intra- or post-procedurally. While two authors report this, it is likely that there is under-reporting of its incidence.6,10 It is difficult to recommend an optimum vascular approach based on the limited experience to date. Some would argue that the transaortic route offers the benefits of the control obtained via transapical TAVI without the additional risk of delivering the delivery sheath ‘past’ the mitral prosthesis in the left ventricle.16 This belief is unsubstantiated by evidence to date and is, therefore, speculative at present. In the absence of solid evidence, it is still reasonable that the least invasive approach should be adopted. Furthermore, it is possible that prosthesis choice is an important factor in this setting, one case report describes the use of the JenaValve, whereby a potential advantage of the prosthesis is the fact that there is a limit to the lower extent of valve deployment in the left ventricle due to the leaflet clipping mechanism built into the valve design.13 Again, while logical, there is insufficient evidence to date to conclusively recommend this. This study has a number of limitations. Case reports comprise the majority of the reported patients; therefore, there is likely bias towards under-reporting of adverse events and complications. This represents a small subpopulation of TAVI patients and is likely to be a scenario encountered quite rarely by each reporting author. Nonetheless, the review we have carried out does have value to those clinicians being faced with this challenge. We demonstrate that TAVI, in patients with a prior mechanical prosthesis, is not only feasible but can be carried out without complication. Meticulous procedural planning is a necessity. Based on proof of feasibility, evidence to date would suggest that patients with mechanical prostheses be actively considered for TAVI going forward. Further studies are required to identify the potential benefits of certain prostheses in this setting. Cardiac orientation: is there a correlation between the anatomical and the electrical axis of the heart?